A Better Way to Adventure Adventure Travel Destinations will take you to the unexpected where you meet ordinary and extraordinary people and visit places that are on the path less travelled. Or Holiday by the travelled path with a different purpose, where you go beneath the obvious and explore cultures and a away of life from the inside out. 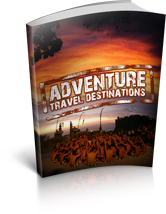 At Adventure Travel Destinations, we like holidays that help us get an insight and a travel experience that is rewarding, enriching and can change lives. We work with local destination companies and authentic hotels, inns, jungle huts, wilderness retreats and luxury villas that are exceptional in character and in value. Adventure holidays should should immerse you in the extraordinary. Cultural Adventures is where you meet ordinary and extraordinary people, see the extraordinary in everyday life of simple folk who are connected, loving and living by a different set of rules. In First Things First, Stephen Covey says we are all driven to learn, love, live and leave a legacy. Adventure travel and adventure holidays that focus on activities around culture and nature in a new setting are a true opportunity to learn about the world from a different perspective, and in the process to gain insights even on your own place in the world. Adventure is living, it moves people out of their complacency and stretches their minds and their spirit. Adventure Holidays are about love when you feel the joy in nature and in the lives that touch you. These cultural adventure experiences can impact other lives that you will touch. We leave our legacy in small ways, in being with others, in what we do, how we do it and mostly in why we do it. In sharing our values and our ideas we touch others and are touched, we learn, live love and give. At Adventure Travel Destinations, we are putting together some real adventures in culture and nature build on grass roots local experience and local knowledge. Its our way to exercise Fair Trade in travel by promoting local companies over big international companies. In doing this we bring more revenue to the destination and also give travellers a better deal. All our local packages have special deals. Vacation Specials and Best rate guarantees are part of the local direct bookings offer we encourage from our affiliates. In cases where we do not have local adventure packages, local hotel and local adventure companies to work with, we show offers by independent travel agents. Like Gap Adventures who do a great job of Grass root holidays that mattrr. Like “The Independent” who we link to for travel stories and travel deals that we find helpful and insightful. We will add Independent travel agents who have a special interest in specific areas and offer a special adventure holiday package. But our primary focus is to connect travelers with local tourism operators offering local adventure holiday packages at a fair price.